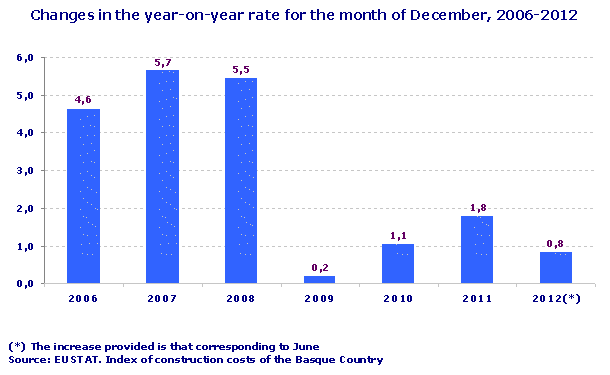 Construction Costs in the Basque Country fell by 0.4% in June 2012 with respect to the previous month, which meant that the year-on-year rate for that month was up by 0.8%, according to EUSTAT data. 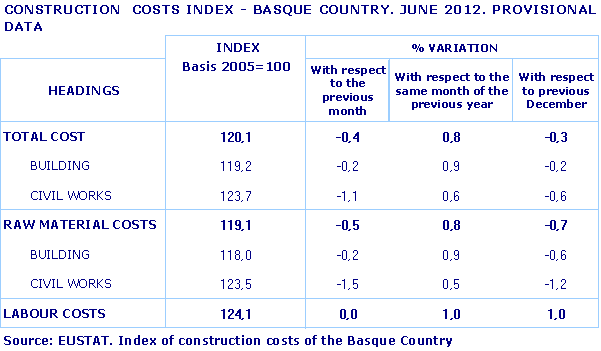 With regards to the previous month, in June 2012 there was no variation in labour costs (0.0%), whereas raw material costs registered a fall of 0.5%. The Building and Civil Works sub-sectors recorded drops in the cost of raw materials in June, with a 0.2% drop in the case of materials used in Building compared to the previous month and a drop of 1.5% in the case of Civil Works. The year-on-year evolution of these two sub-sectors illustrates differences in intensity between them: costs of raw materials in Building rose by 0.9%, whilst costs in Civil Works rose by 0.5%. Electricity & Gas (10.5%), Machinery (6.0%), and Chemical industry (3.4%) stood out amongst the sectors that experienced the highest inflation rates over the last twelve months as regards prices of raw materials. In contrast, falls or less dramatic increases in annual prices (June 2012 on June 2011) were witnessed in the prime materials of the Metallurgy sector (-5.3%), Manufacturing of other Non-metal Mineral Products (-0.3%), and Manufacturing of Furniture and other Manufacturing Industries (0.1%).